Since 1901, we’ve been at the forefront of holistic and metaphysical publishing and thought. We’ve been a source of illumination, instruction, and new perspectives on a wealth of topics, including astrology, tarot, wellness, earth-based spirituality, magick, and the paranormal. 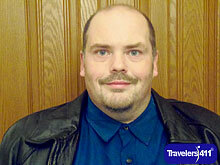 Richard Southall, Author of Haunted Route 66 was on the December 15, 2013 "Travel with Stephanie Abrams!" Radio Show in hour 3. Richard Southall was also on the November 16, 2013 "Travelers411" Radio Show in hour 1.